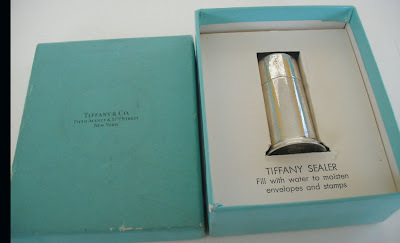 Last week, a friend took me to an outdoor film series where we watched Breakfast at Tiffany's. Heaven knows how many times I've seen that movie, and yet, I never tire of it. 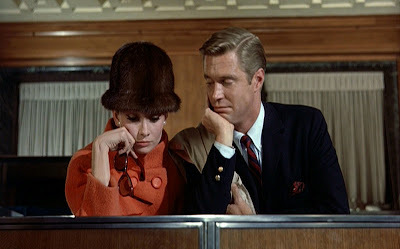 I covet Hepburn's Givenchy wardrobe (who doesn't? ), not to mention Hepburn's perfect shade of pink lipstick that she wears throughout the movie. I've been looking for a similar shade for twenty years and have yet to find it. 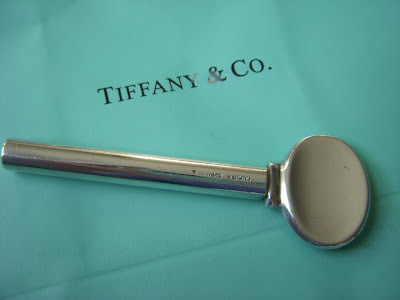 Of course, one of my favorite scenes is when Holly and "Fred" are at Tiffany in hopes of finding a trifle that costs under $10. The salesman shows them the now famous sterling silver telephone dialer that Fred/Paul declines in hopes of finding something more romantic. 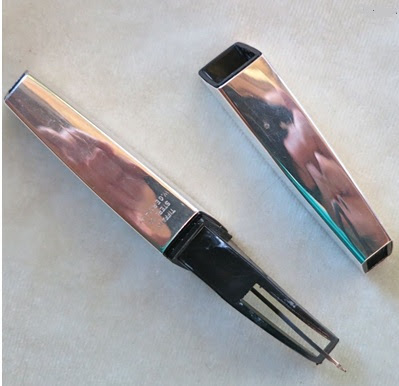 Granted, a telephone dialer might not be romantic, but it sure was snazzy looking. I remember when Tiffany used to have all kinds of trifles, ones that could elicit a snide "How could I have lived this long without it?" from some unimaginative wiseacre. 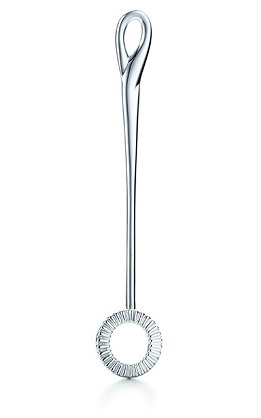 Trifles like a sterling silver toothpaste key which one placed at the end of the tube so as to help dispense the paste with stylish ease. 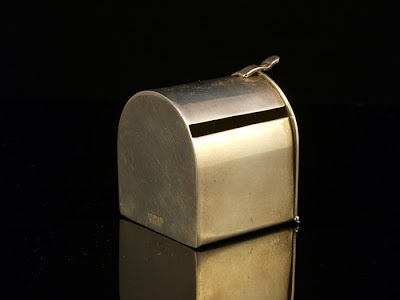 (My parents actually own one of these, and I've always thought it was the most fabulous thing ever.) 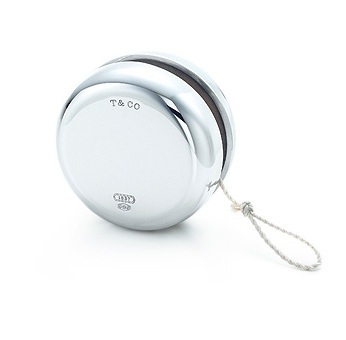 There was also the sterling noisemaker that you could spin around to add a little noisy merriment to one's New Year's Eve celebration. 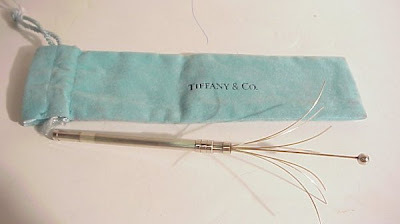 And what about the sterling whisk-like stirrer that helped to get rid of bubbles in champagne? 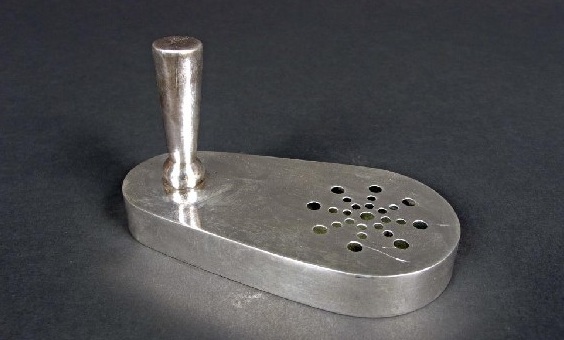 The now famous telephone dialer. 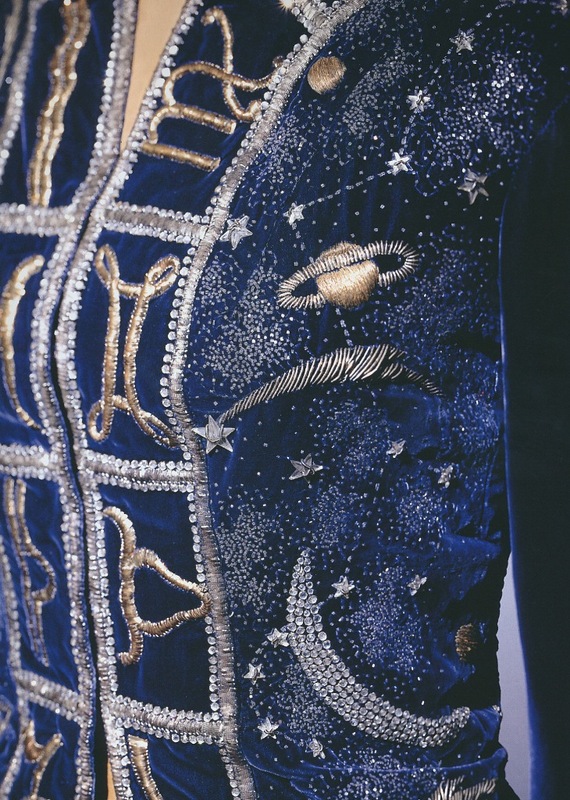 This fabulous velvet evening jacket was designed by Schiaparelli for her Winter 1938-39 collection. 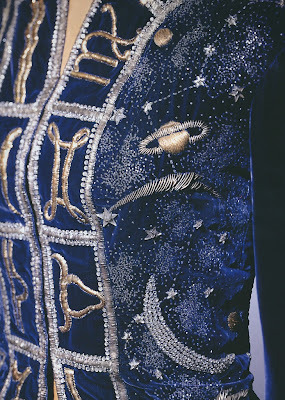 That gorgeous celestial embroidery was, by the way, done by none other than Lesage. 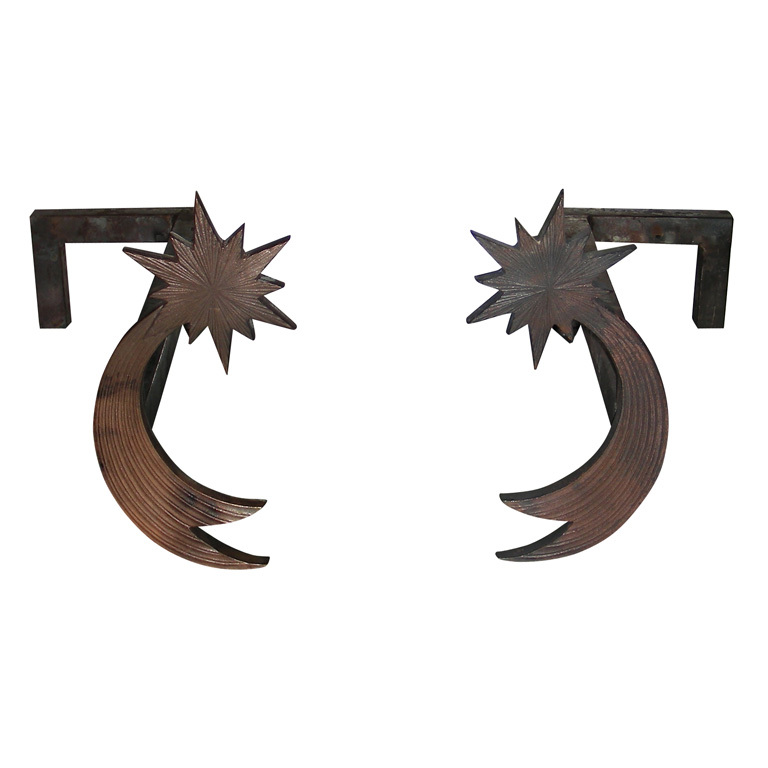 I get positively starry eyed (sorry!) 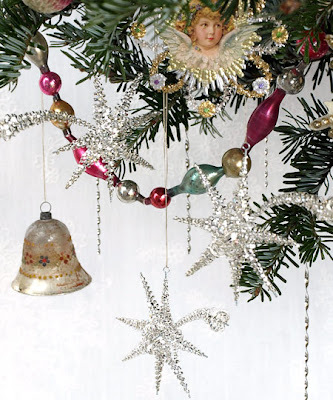 with anything adorned with comets and shooting stars. 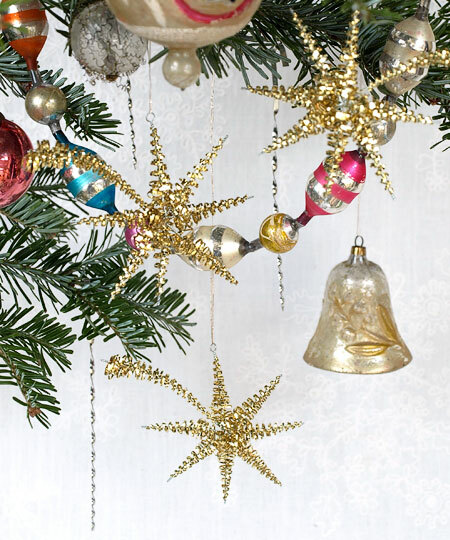 But darn it if I was a little stumped trying to find items decorated with the motif. 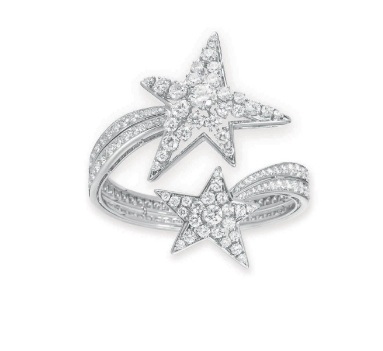 Chanel's iconic shooting star jewelry was a given, but it's not easy to find fabrics, wallpaper, and china depicting shooting stars. I did find an embroidered shooting star Sarah Palin 2012 baseball hat, but I figured it best to leave that one out! On the other end of the entertaining spectrum was Chuck Williams, founder of Williams-Sonoma. 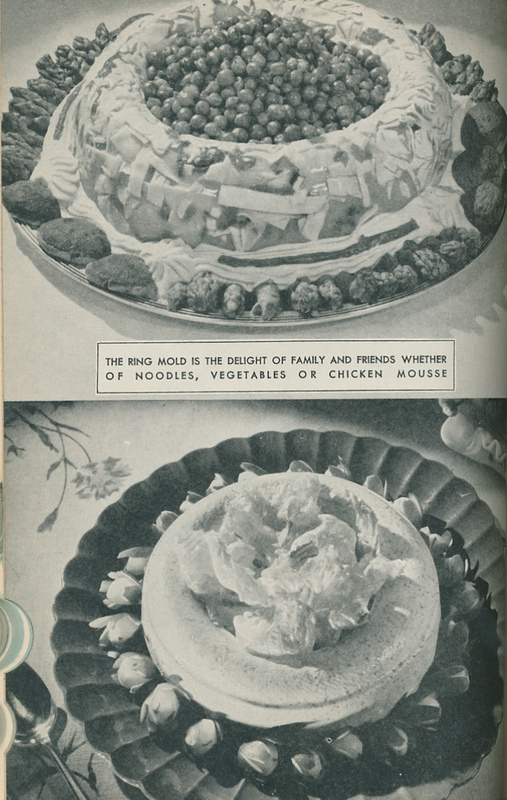 Although his hosting skills and menus might not have been as dramatic and lavish as that of Mr. Guth, Williams was no less an impressive cook. 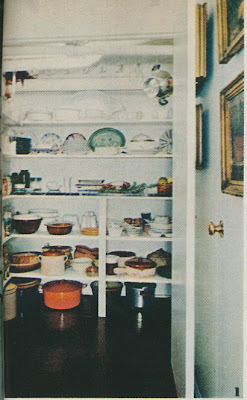 In the 1972 House & Garden article, Williams said that his twice monthly parties were always held in his spacious and comfortable kitchen. 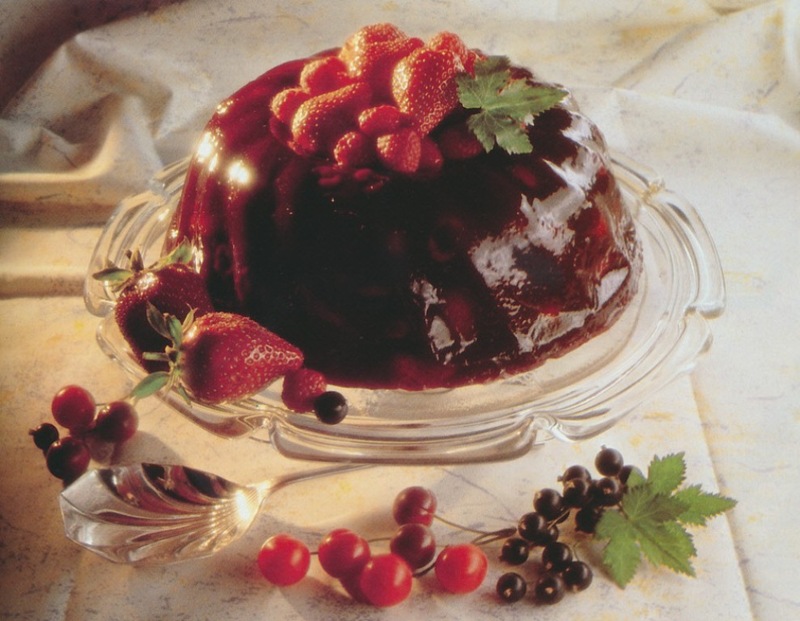 Dinners were usually for six and did not consist of numerous courses. 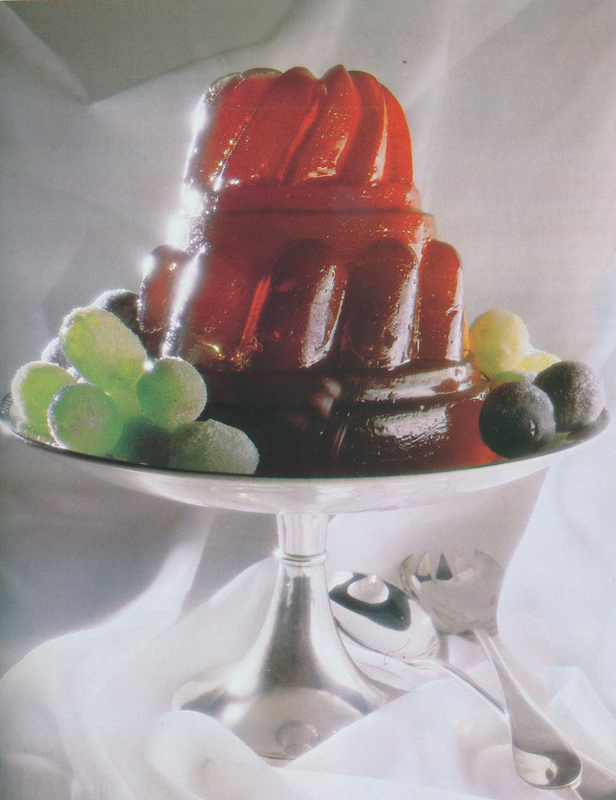 Said Williams, "I don't go in for numbers of courses, it's too difficult to manage." 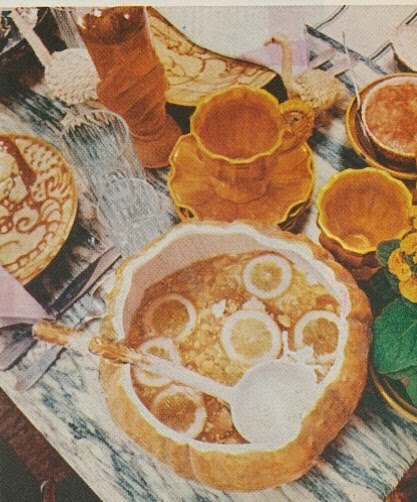 Pre-dinner cocktails were often accompanied by finger food like Endive and Crab Legs with Curry Mayonnaise. Many of Williams' recipes were inspired by James Beard and Elizabeth David, although Williams noted that he used little seasoning with his recipes. He noted that he preferred to serve vegetables with a simple squeeze of lemon juice rather than herbs. 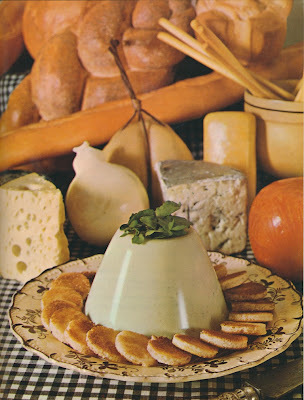 Simple, yet still delicious. 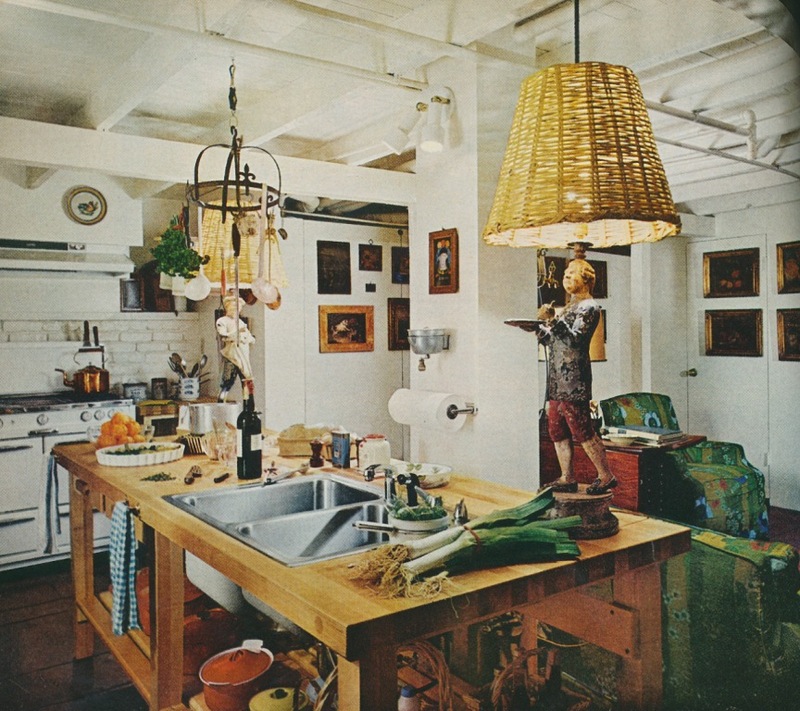 Williams charming San Francisco kitchen. 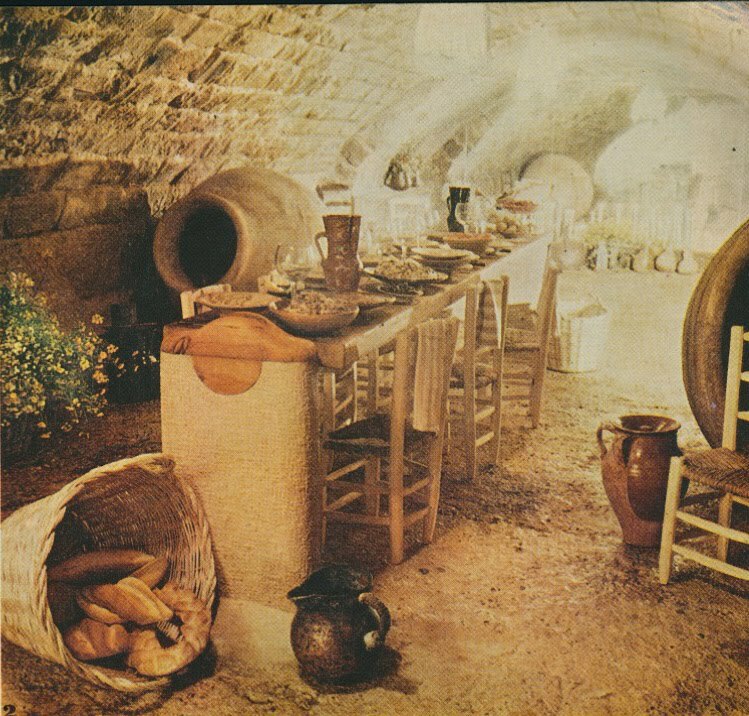 The dining area of the kitchen with a rustic dining table and chairs. It's no surprise that Williams had an abundance of tools, gadgets, and cookware. 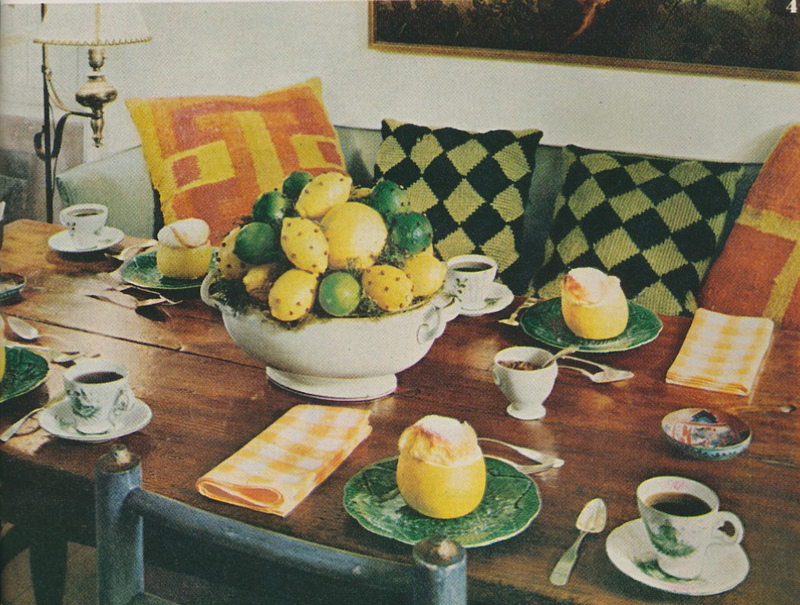 A centerpiece of clove-studded lemons and limes. 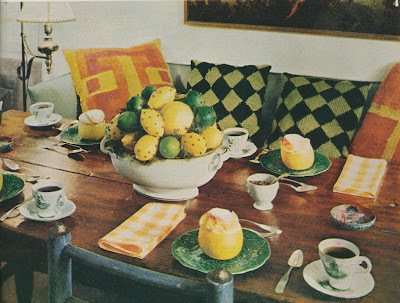 On each plate was a Grapefruit Souffle. 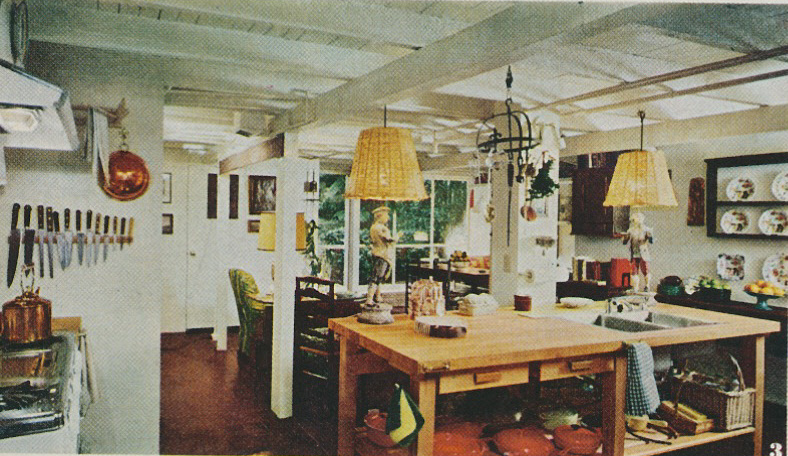 All photos from House & Garden, July, 1972. You might remember Mr. Francis Guth, the prolific home cook about whom I wrote recently. (Click here to read the post.) Profiled in a 1971 issue of House & Garden, Guth was photographed at his idyllic Irish manse. What fascinated me about Guth was his enthusiasm for the good life. 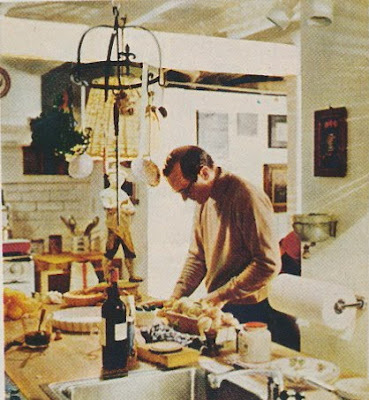 He was a gentleman farmer, a gentleman fisherman, and, more importantly, a gentleman cook. The article mentioned that Mr. Guth and his family spent half of the year in Ireland and the other half in Spain. 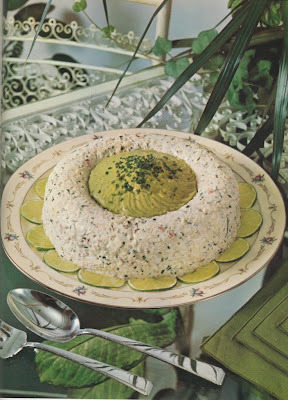 (Evidently, Mr. Guth was an authority on Spanish cooking.) Well, last week, I received a 1972 issue of House & Garden from a dear friend, and lo and behold, the issue featured an article on Mr. Guth's house in Ubeda, Spain, part of a series titled "Great Gentlemen Cooks". Once again, Mr. Guth set the bar high with his über-enthusiastic style of entertaining. 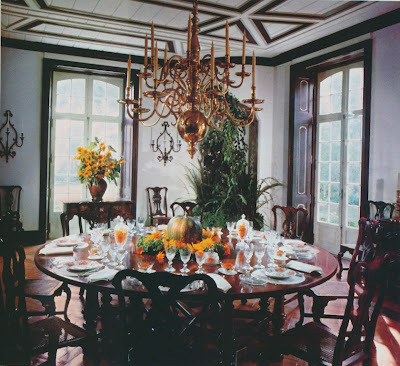 Guth didn't entertain in just one room of his Spanish house; the entire house was a stage for dinners and parties. 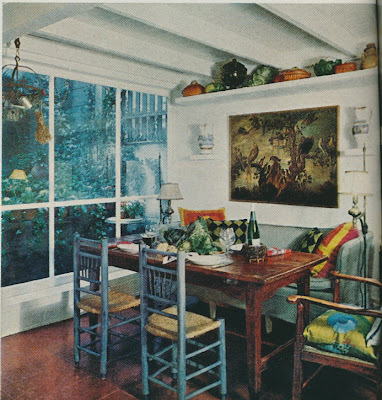 Guth especially liked to host dinners in his kitchen (where sofas gave his guests a perch from which to watch Guth cooking), his dining room, his wine cellar, and in a space under the eaves. 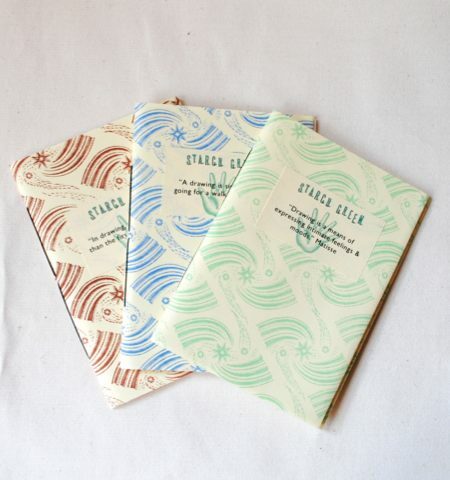 And, he gave readers not one but four suggested menus. Chinese Dinner In The Salon included Cold Marinated Chicken Livers, Lobster Cantonese, and Hot and Sour Soup; American Lunch In The Studio featured Carolina Pork Barbecue and Herbed Bean Soup; Moroccan Dinner In The Loggia meant Meat and Chick Pea Soup and Black Olive, Lemon, and Mint Salad; and Farm Kitchen Lunch saw Asparagus Gazpacho and 'Bacon from Heaven' Flan. 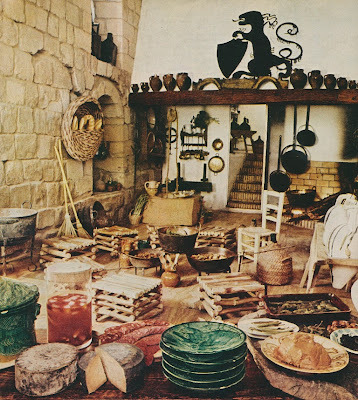 Guth suggested that people should "learn to cook in all languages", and based on the menus above, it seemed that he practiced what he preached. Take a look below for a little taste of Mr. Guth's cooking. And stay tuned for Chuck Williams' take on entertaining tomorrow. 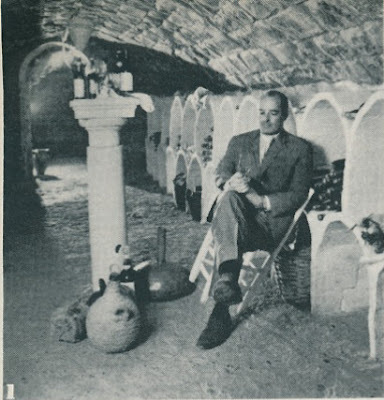 The Guths' vaulted wine cellar where a "classical Spanish dinner in honor of poet and gastronome Balthazar de Alcazar is recreated." The kitchen where dinner was often served. Mrs. Guth made the ceramic plates. 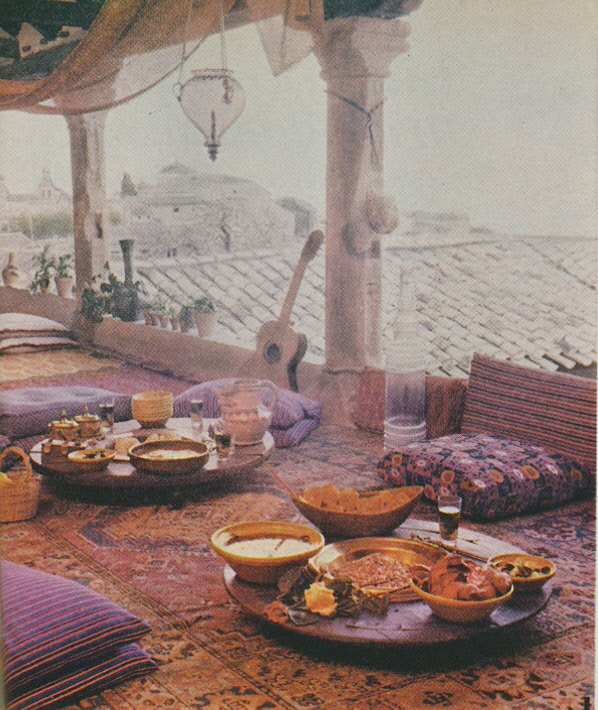 A Moorish dinner was served on the loggia. 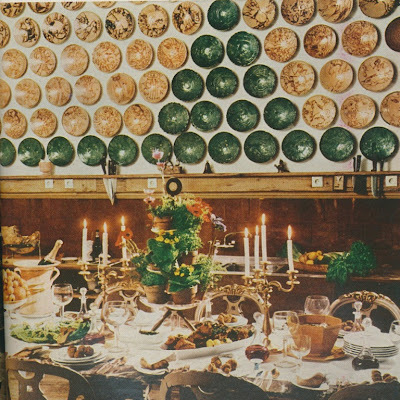 Spanish braziers served as tables. Herbed Bean Soup served in a pumpkin tureen. 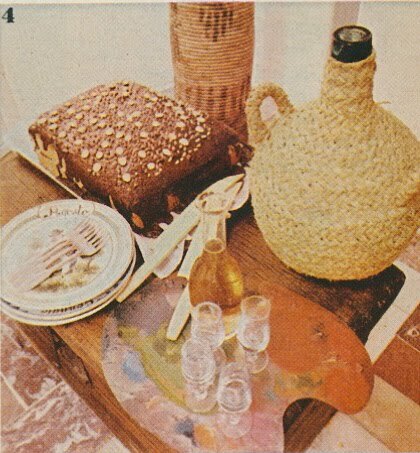 Chocolate sponge cake and a bottle of apple-jack were displayed on an artist's palette. Mr. Guth selecting wine in his wine cellar. I'm still on my week long hiatus, but I did want to pop by to mention a fun opportunity that will appeal to all who have a passion for antiques. 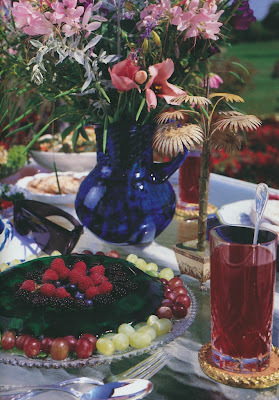 The 2012 East Hampton Antiques Show will kick off with a preview party this Friday night. 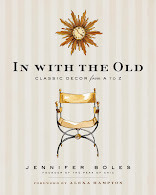 In honor of this well-regarded antiques show, House Beautiful, an Antiques Preview sponsor, will be giving away five of their favorite picks from this year's show. 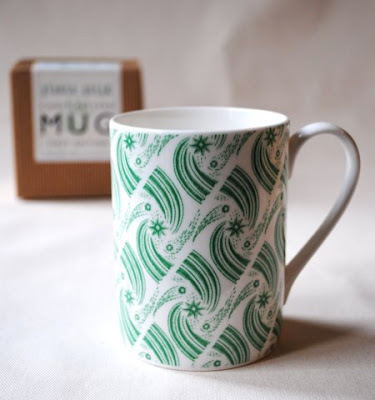 The items, all of which can be seen below, are available for your perusal on House Beautiful's Facebook page. 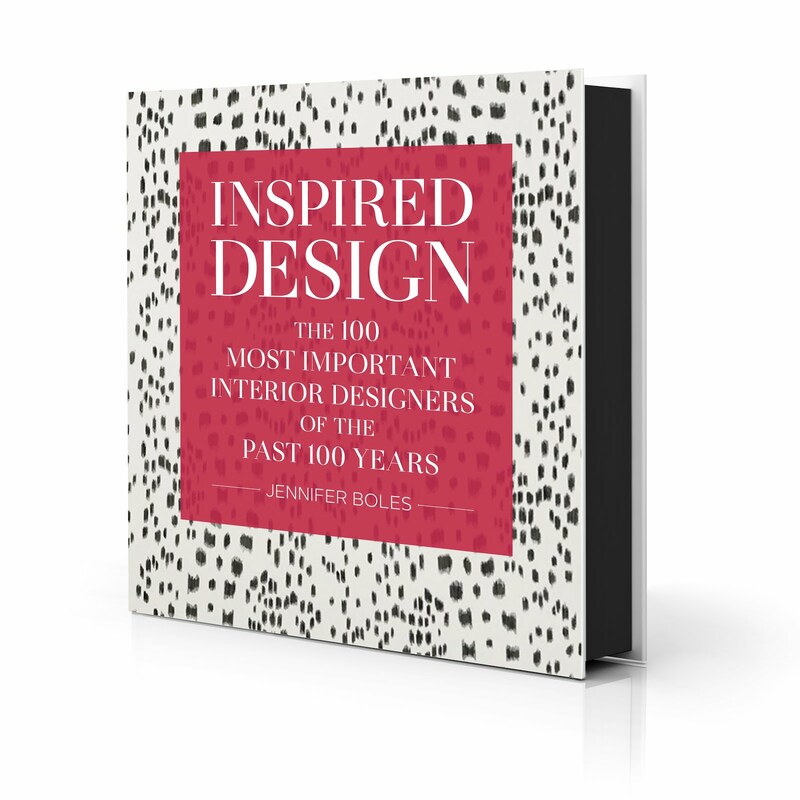 All you need to do to enter to win one of the items is to follow House Beautiful Editor-in-Chief Newell Turner on Twitter (@HouseBeautiful) live from the show between 6:00-8:00 p.m. on Friday, July 20th and then retweet a prize mention. 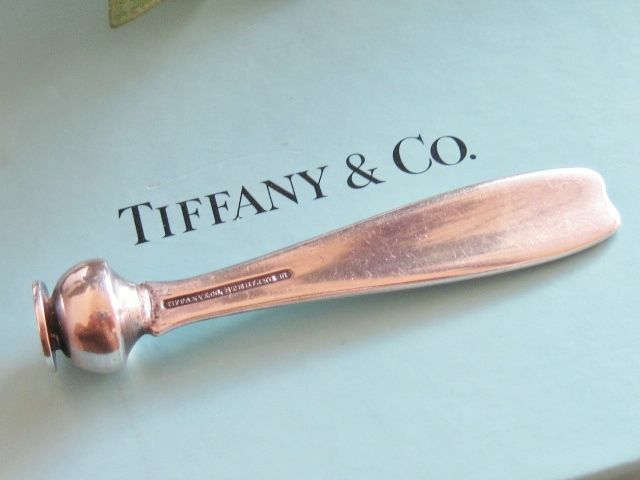 You'll then be in the running to win of the five antiques below. Good luck! For more information on the contest, visit House Beautiful on Facebook. For more information on the show, visit The East Hampton Historical Society. 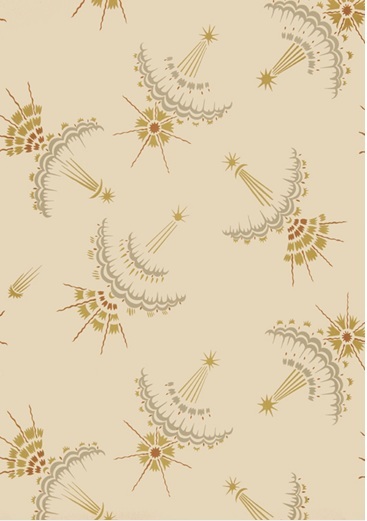 And don't forget to follow House Beautiful Editor in Chief Newell Turner's tweets live from this Friday's Preview Party. 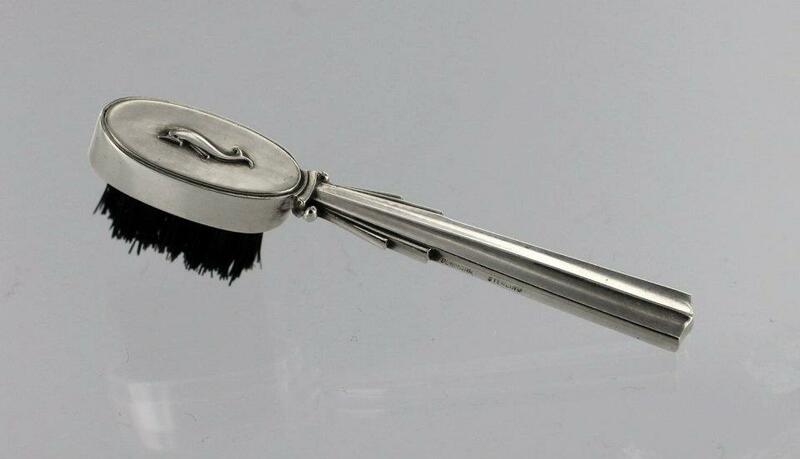 A vintage Georg Jensen Art Deco eyebrow brush No. 150 decorated with a Dolphin motif. 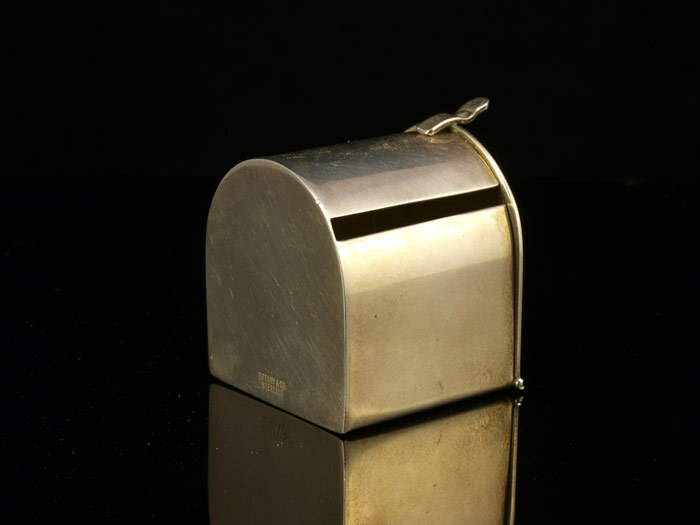 Available through Drucker Antiques Inc., Mount Kisco, NY. 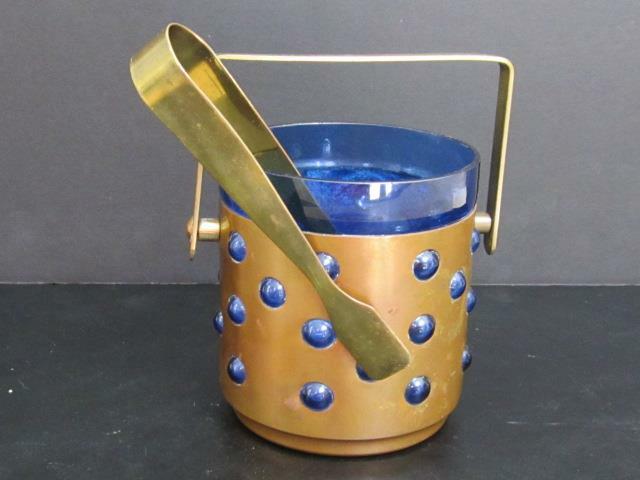 A circa 1930's brass and blue glass ice bucket with brass tongs. Available through Flowers & Company Antiques Center, Southhampton, NY. A Japanese studio pottery vase with mottled aqua glaze; original "Japan" label on bottom. 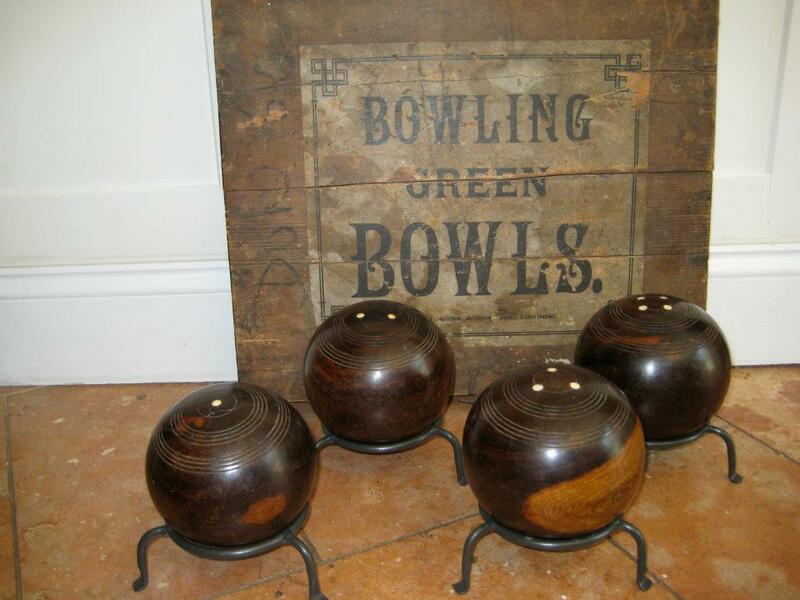 Availabe through David Bell Antiques, Washington, D.C.
Set of four late 19th c. English Lawn Bowls; made of Lignum Vitae and ivory inlay. 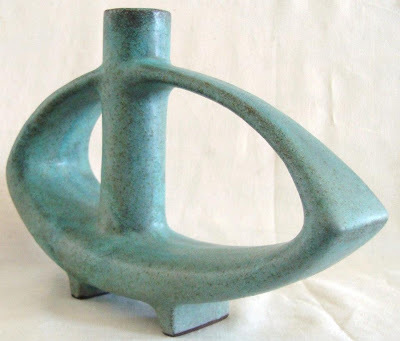 Sold by Lawrence Farms Antiques, Chappaqua, NY. 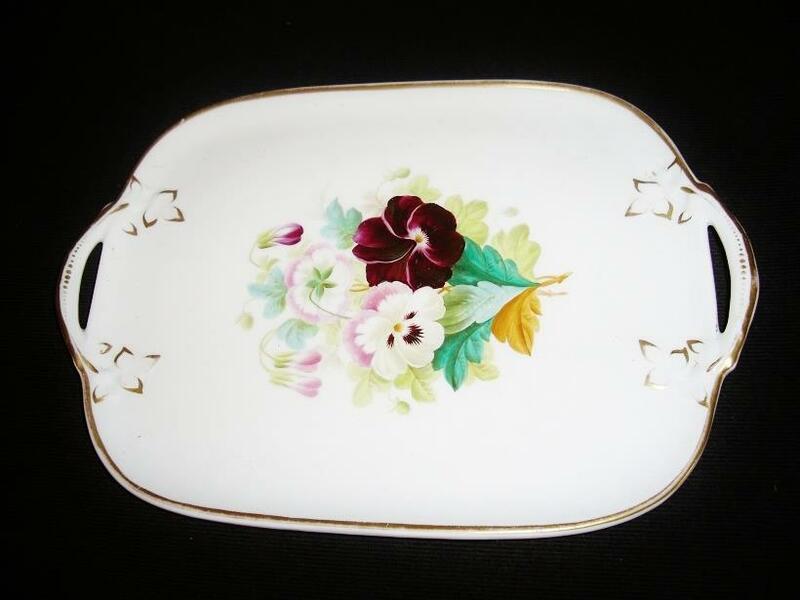 Early 20th century French porcelain tray. From Anita S. Taub, New York, NY. I'm taking a few days of R&R, but before I leave I want to make sure you know about Christopher Spitzmiller's Annual Seconds Sale. This year's sale runs from Tuesday, July 17th to Friday, July 20. There is a wonderful array of lamps- over 50!- which will be marked at 45% to 55% off the retail price due to minor imperfections. But like I've said in the past, these imperfections are minor; I have yet to find the imperfections on my seconds lamps. But despite any minor flaws, my seconds lamps are perfection to me. 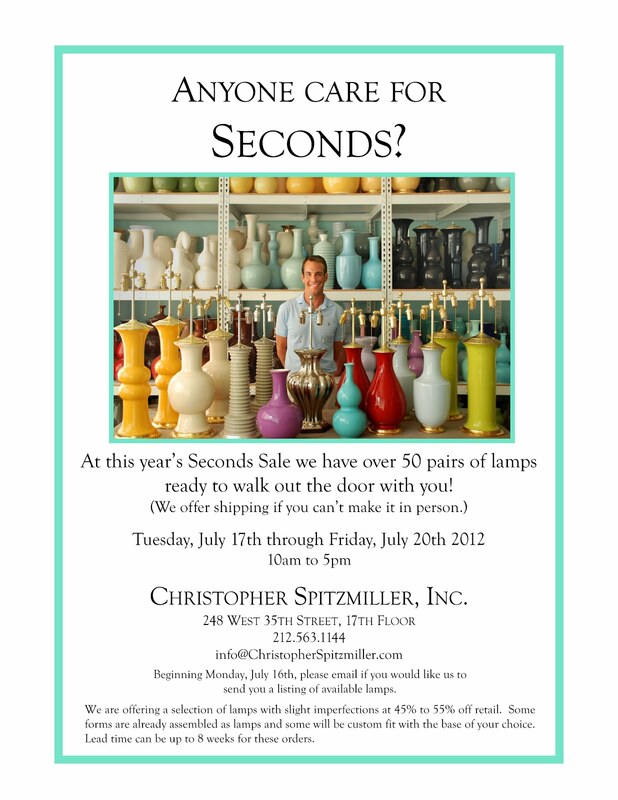 If you would like to request a list of available sale lamps, you can do so by emailing info@christopherspitzmiller.com beginning Monday, July 16th. You can also click on the flyer above to read more info. 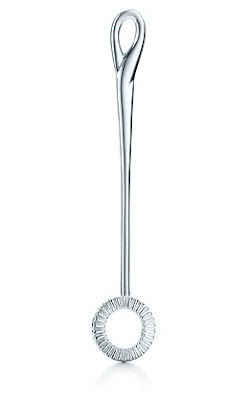 This is a great opportunity to own some of Christopher's scrumptious lamps at discounted prices! One of my favorites of the late, great decorators is Valerian Rybar. Rybar's clients were the swellest of the swells, and they hired him to decorate their Tyrolean schlösser, Parisian hôtels particuliers, and Manhattan triplexes. One of his clients, the American Mrs. Graham D. Mattison, even hired him to decorate her Portuguese villa, seen here. 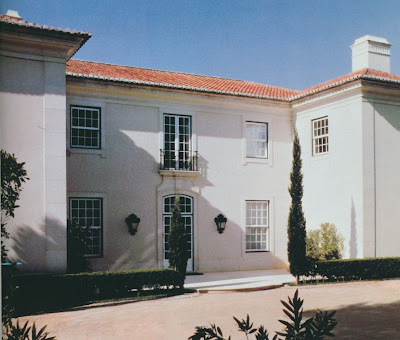 The Mattison villa, located in Cascais, was designed to resemble an 18th century patrician Portuguese villa. 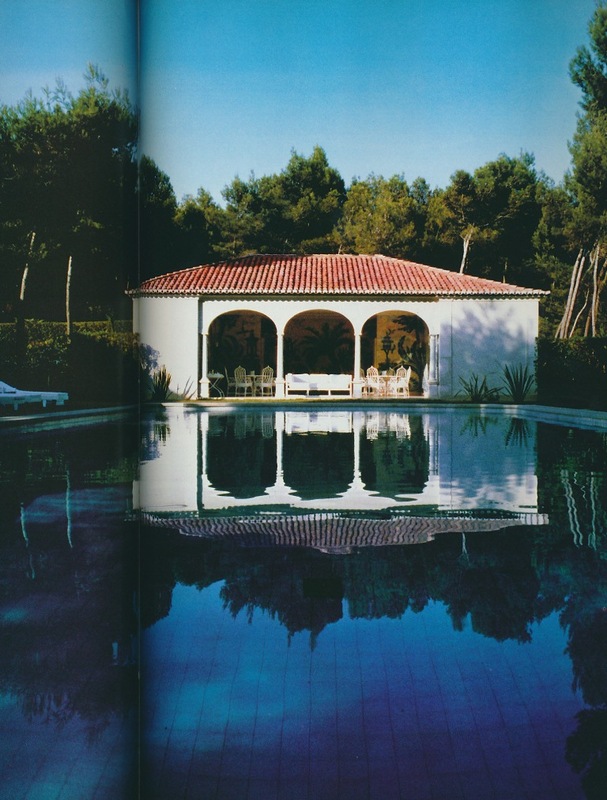 With the help of French architect Pierre Barbe, Rybar chose polished brick and stone for many of the floors, Portuguese blue and white tile for the pool house, and ornate tray ceilings throughout. But just because this was a villa in the country, Rybar didn't forsake his noted high style decor. There were dressy rugs, elegant antiques, and even a mirrored oval bath. After all, even when Rybar's high flying clients wanted to relax, they wanted to do so in luxurious surroundings, and I can't think of many country houses more luxurious than this. The Entrance Hall. 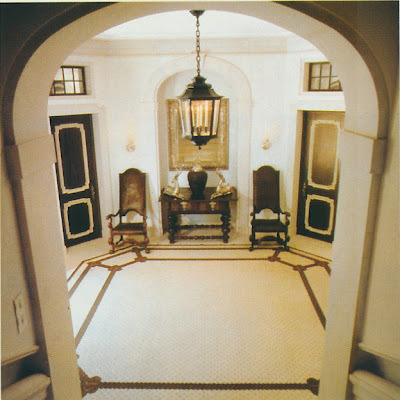 Look at that wonderful rug with the rope motif border. The Library also had a unique rug, not to mention that grand tray ceiling. 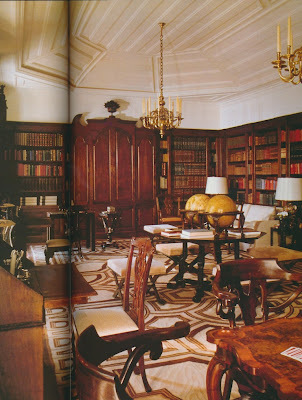 Another view of the Library which shows Rybar's use of symmetry. The Dining Room with a patterned tray ceiling. The brass chandelier was Dutch. 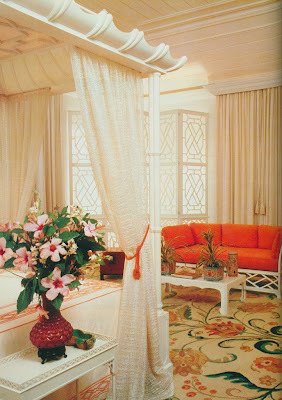 Mrs. Mattison's bedroom was a vision in Chinoiserie. 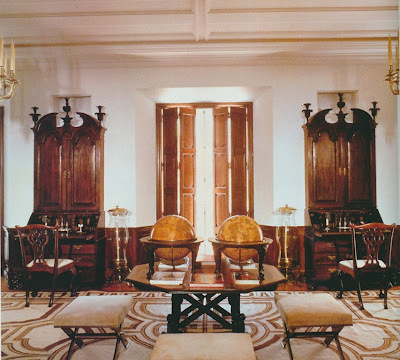 A Portuguese hand-stitched rug covered the polished brick floor. 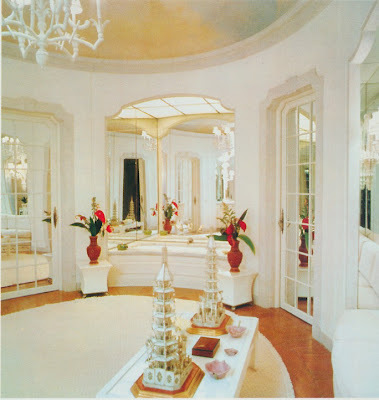 The oval Master Bath. This ceiling was painted to resemble a cloudy sky. The Swimming Pavilion. 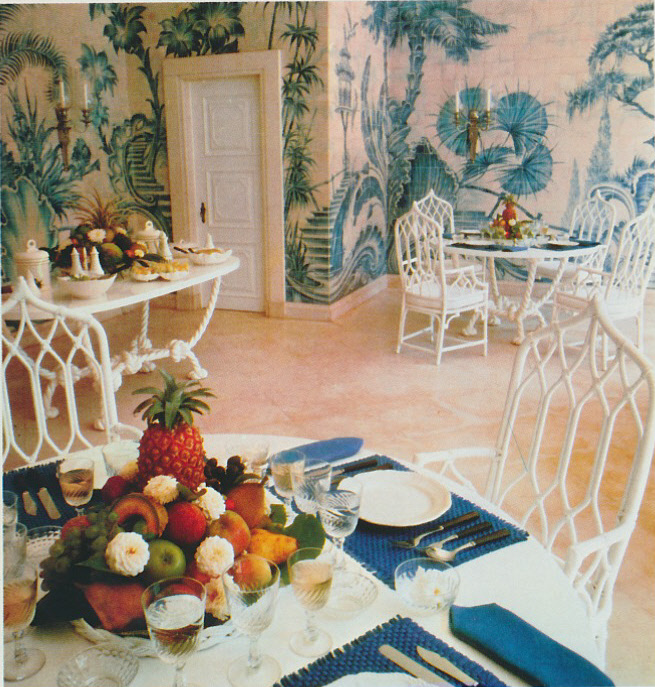 The interior walls were covered in blue and white Portuguese tile; their Chinoiserie design was meant to resemble Pillement's work. All photos from Architectural Digest Chateaux and Villas .